The virtue of an art that knows its mind. Setting up a second posterous blog took about 30 seconds, most of which was finding the quote for the subtitle . I can now use the Posterous Bookmarklet to post a quote and tweet it: example. 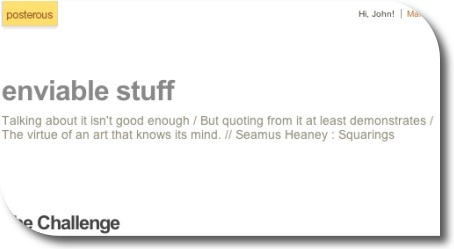 I like saving quotations, but sometime I don’t want to use delicious, instapaper, evernote or any other of the myriad of services I’ve signed up for. Posterous is continuing to evolve into a more compelling tool all the time and will hopefully be a good fit for sharing and storing quotations.